As I type, the sturdy MacBook Pro has 29% battery power left. This is not because I forgot to purchase those handy power converters (I have two in my bag), but rather because I don’t think it would be a good idea to cut off that third prong on the MacBook Pro power cord just so I can get it into the two-prong outlet converter (I’ll figure this out once in Cyprus, or so I tell myself). 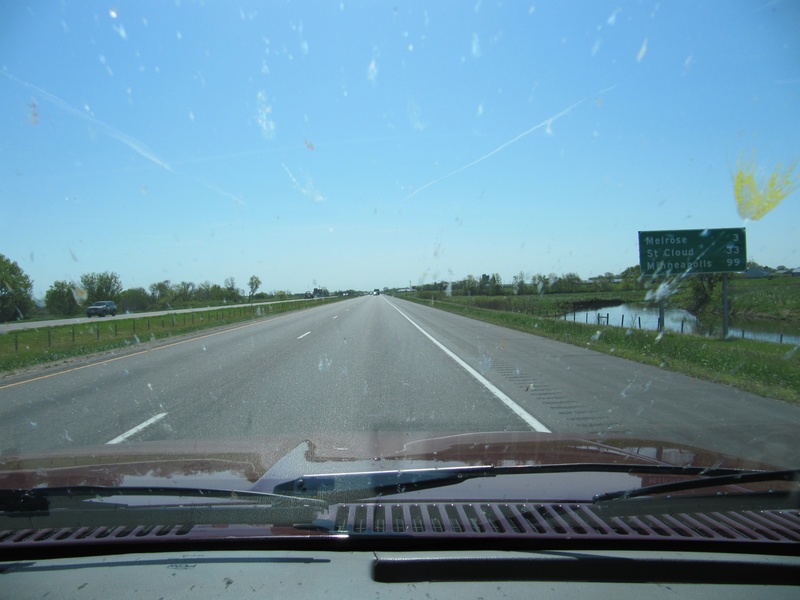 When you’re driving from Fargo to Rothaus’s in Sauk Rapids, Minnesota, your windshield starts looking like this. fieldwork in Cyprus. Yet it seems more reasonable to consider the point at which the tickets are purchased as a type of prologue, or introductory transition, that signals the eventual beginning of a trip. Life is one gradual push out of one situation and into another, and the only way to distinguish between one event and the next is to psychologically impose order on it. Sometimes students will say (and I understand why they say this), “This isn’t how we did it in high-school.” Often I tell them I know, but I counter by explaining that it is no longer high-school, and this in turn is part of pushing out of one situation in life and transitioning into another. In many ways this is called reconditioning one’s behavior. In lay-terms it is known as getting one’s crap together. Much of life is about getting there, about getting one’s crap together to get there. From London, tell the pilot to head east-bound across the channel, and then hang about a 45 degree right at Brussels. Eventually you’ll get to this. reaches a point where it is half way there. Then it is half-way to half-way there. Then half-way to half-way to half-way there, and so on, and the question remains: how does the arrow ever get to the tree if it is always half-way there? He said, “Zeno did not have calculus technology yet.” I said, “Yeah, eventually I’d have to tell Zeno that the arrow will get there when it gets there.” Rothaus eventually got me at that top-tier roadway at MSP International. The line at the airport wasn’t much of a line. Instead it was the standard mob of confusion and misdirected energy, as it normally is at airports. Numerous individuals are dropped off, and they are all looking to be in a hurry and get where they need to get. A confluence of human energy shuttled through the check-in lines and security, all preparing to board planes that take them to different regions, different parts of the nation, or on some international travel, perhaps even a relocation or re-settlement. Airlines are hybrids of government (for the people, by the people) and corporations (a few making money by providing a service to the many), and they do what they can to manage this grand confluence of energy. 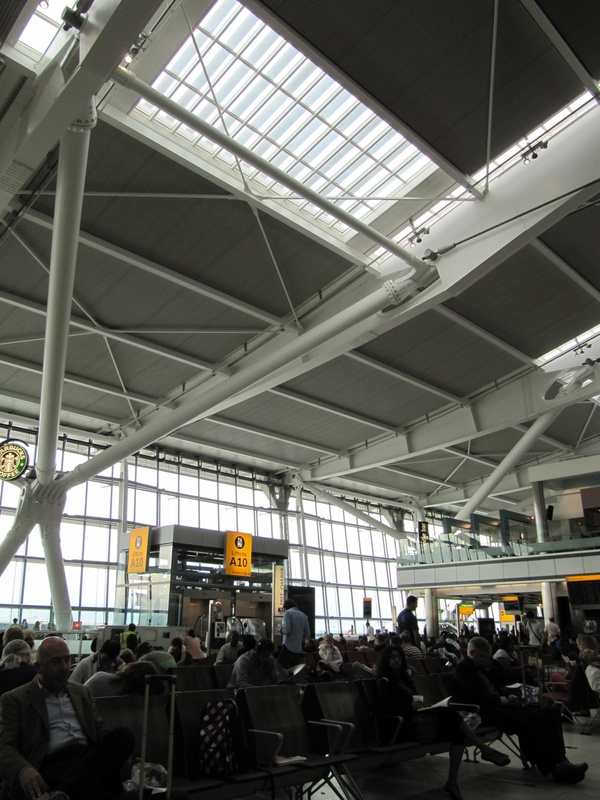 Terminal 5, the correct terminal at Heathrow, and the obligatory Starbucks and some clear-span interior architecture. The airport’s architecture gives the feeling that one is inside of an airplane wing. At the terminal gate I had about 28 minutes to kill (or, if you’re French, 28 minutes — or time — continued killing me). An airport tavern that sells those over-priced beers was within meters of my terminal, so I decided to imbibe and refortify. The bartender, it turned out, originally hailed from Bulgaria. He immigrated to the United States some 20 years prior as a university exchange student. He said he studied veterinary science and technique at the University of Minnesota, the St. Paul campus. “My family has lots of animals back in Bulgaria!” he said over his shoulder to me, while walking away to pour another draft beer. Two bar-stools to my right was a woman drinking a half-glass of white wine. Eventually she confessed to the bar tender that she was unprepared to return home to Virginia as she had been having such an agreeable time with her family in the Twin Cities. The bar-tender wanted to chat about the famous borderlands rivalries of eastern Europe, vestiges of the Ottoman Empire, the Balkans, Greece (and so on and so forth). I reframed the conversation and asked him if he heard about Zeno of Citium, especially about Zeno’s awesome beard (pointed out to me by a friend from Missoula), something Chuck Klosterman may be aspiring to as well. I boosted the exposure on this in order to see the early morning lights in Athens a bit better. 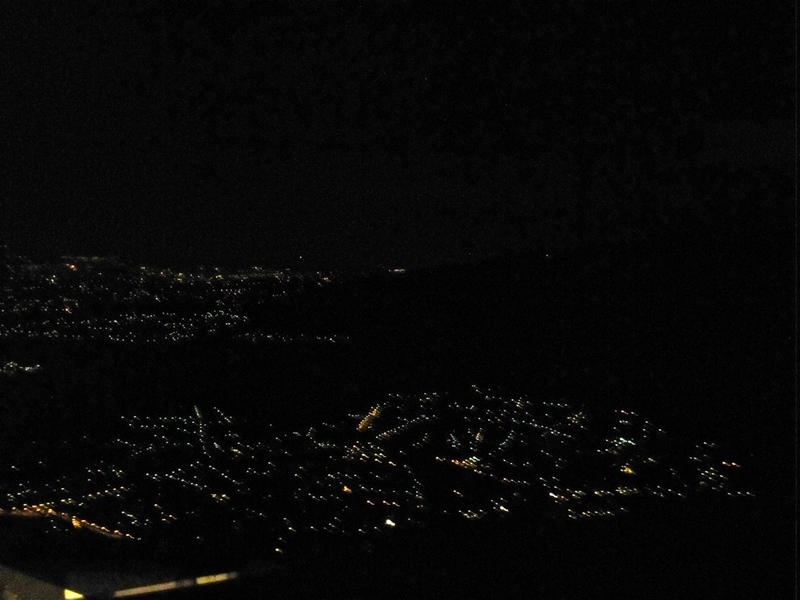 This photo was taken about 2:30AM on the inbound flight. Then it was from MSP to Dallas/Ft. Worth, north to south across the Great Plains, to join up with a connecting flight from said Dallas/Ft. Worth across the Atlantic to London. If I had to do this all over again, I think I’d try to avoid another 8 or 9 hour layover in Heathrow. The hours pile up, and eventually when you’ve entered into a type of time vacuum continuum (which is common when spending large amounts of time in airports), and all the hours seem to revert and jump forward and then revert again, and you’re trying to purchase your second power converter, the merchant will invariably check your ticket and inform you that you need to be in Terminal 5 rather than purchasing power converters, eating panini sandwiches, and thinking you’re in the correct terminal while people watching for hours on end in Terminal 3. Thank the merchant after she or he points this out for you. Out of all the airports, the personnel in each one must have some kind of Aaron Barth Management Training. They are certainly ready for us. 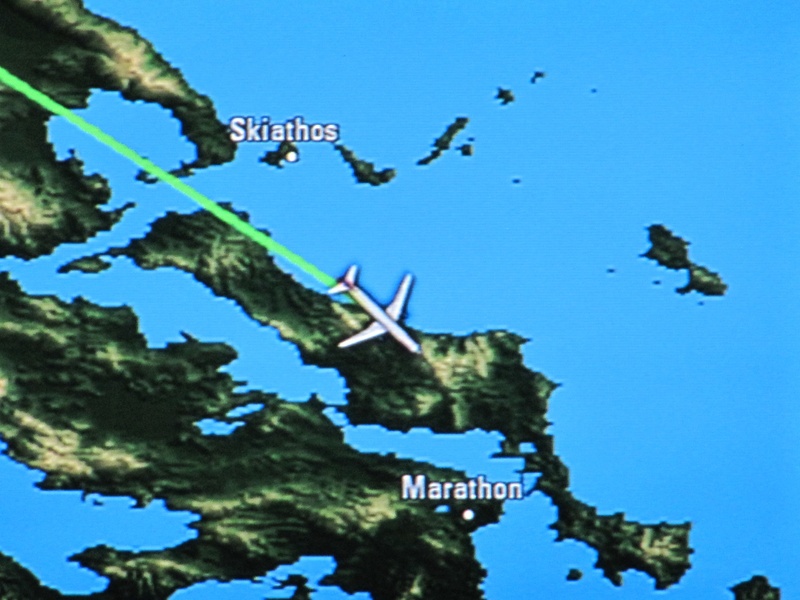 They are all extremely pleasant, from MSP to Athens. The power level in the MacBook Pro is at 18%. Time to post and shut down. This entry was posted on Tuesday, May 15th, 2012 at 8:36 pm	and tagged with Athens, Fargo, Greece, North Dakota and posted in Uncategorized. You can follow any responses to this entry through the RSS 2.0 feed.